As holiday shopping winds down, and you prepare for new inventory, bundling products together is one way of selling or clearing-from-inventory less popular items. In this post, we will go over the advantages of bundling products, and two apps that can help you bundle products on Shopify. Bundling means that two or more products are combined and sold as a package. The package price is lower than the sum of prices of individual items within the package. As an example, if you sell shaving equipment, and the regular prices are: $30 for the razor with handle, $10 for shaving cream, and $10 for the after-shave, you can bundle all three and sell the package for $40 (whereas, individually the price would have been $50). In this way, bundling can create an advantage for customers if they purchase more products on your store. Usually, the products in a package are complementary items. 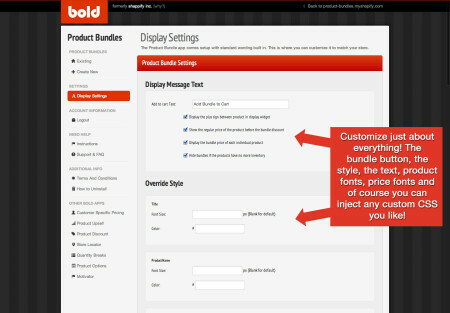 You can also include newly launched products or less popular items in your bundle to increase sales for those products. This can help you manage inventory for related items. Note that the items should be somewhat related. If I am purchasing a shaving razor, chances are I will not go for a bundle that has the razor, and a USB adaptor for charging my phone. Another thing to keep in mind is that product bundles work if customers still have the choice to purchase those items separately, according to a Harvard Business School study. When you give customers the option to purchase items individually as well, you are increasing choice, rather than forcing products on customers. You can bundle products on Shopify through two popular apps. The Product Bundles is a powerful app that allows you to create and configure product bundles for your store, and add a widget to display the bundles. You can create a bundle for two or more products based on specific products, or based on any product selected from specific collections. The app automatically detects the products in the cart to apply the bundle pricing, whether or not customers add the entire bundle from the widget. 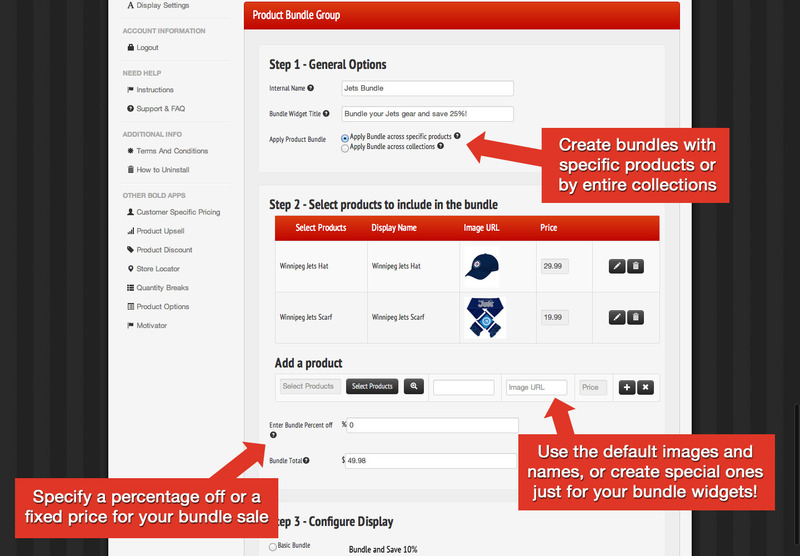 Bundle pricing is applied even if customers separately add products within a bundle. The bundle price is automatically removed if customers remove an item that is part of the bundle from the cart. You can set a percentage discount or a set price for each bundle. Note that if a product has variants, you will only be able to set a percentage discount for that bundle. In addition to creating bundles, you can control the styling of the widget and the content that is displayed for each bundle. You can modify the style to match that of your store and branding. See the demo store for Product Bundles in action. The Directed Edge Product Recommender app can create a widget for related products, including product bundles. You will have to include a little bit of code in your template files within your Theme to display the widget. Here’s an example of how to include the widget on a product page. Take a look at the demo store to see the app in action. The pricing for the app depends on the Shopify plan you have. See the table below for current prices. Note that the app has a few limitations like not being able to set more than two items in a bundle package, and not being able to set a discount percentage for the bundle. Bundling products is a key way to increase sales and your average order value. When you bundle products together, you also create a higher perceived value for customers. Customers feel rewarded as they get a discount, and you create a positive association with purchasing more products on your store. Product bundles also create convenience by showing items that are typically purchased together. Customers don’t have to sift through your product pages to add these items to their cart, which can enhance the customer experience. You can also highlight new products, or less popular products by including them in a bundle with a popular product. This can be especially helpful as you get rid of inventory for the end of the season. Shopify has two popular apps that you can use to include product bundles on your store. Both apps add a bundle widget to your store with little or some coding required. Do you bundle products on your store? Tell us your experience with bundling.